This church list was transcribed by Forrest Manning. This church list was transcribed by Forrest Manning. He has generously donated this listing to the Northeast Kingdom Genealogy web page. 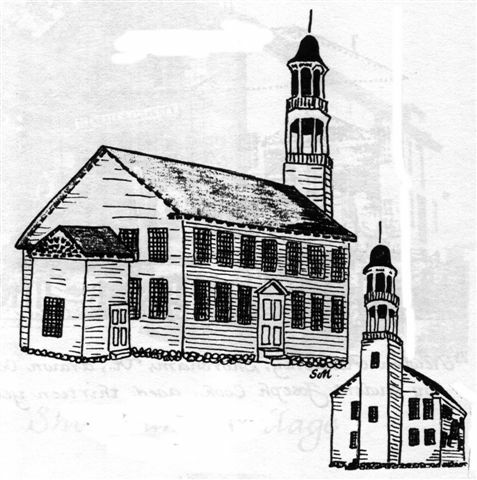 List of subscribers for the original building of the Congregational Church in Shoreham, Vermont. Feb. 3, 1798. The list is presented in the order in which it was written in the journal of the church. Permission for publication granted by the church. List typed by Forrest Manning with the very welcome assistance of Susan MacIntire of the Shoreham Historical Society. Phinehas Benton Joshua Healey Stephen Newel Ebenezer Rurrill, Jun. Note: Daniel O. Morton was the father of Levi Morton, Vice President of the United States in the Banjamin Harrison administration. These lists were a recent find in the old church records. Thomas Bateman Thomas Chipman Samuel Hemenway Eli Snow, Jr.